Sportifs are probably the fastest growing area in our sport and dominate pages of the cycling press. Clifton CC are right in the mix - both at home and abroad! Recent years have seen members take part in what is arguably the hardest continental challenge of them all - la Marmotte. Arthur provided a graphic account of how he and Steve took on the toughest mountains and only narrowly missed gold medal winning times. Several riders have completed the event with the highest profile in this country - l'Etape de Tour (traditionally a mountain stage of the Tour de France). 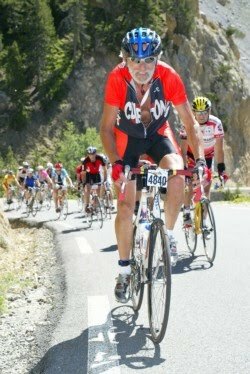 Willie took on the might of Alpe d'Huez at the end of the 2006 edition despite suffering a serious injury the previous year and provided a typically self deprecating account of his adventure in the Cliftonite. There are 3 members entered for 2007. Domestically the Fred Whitton event in the Lake District provides an early season test for those lucky enough to get the timing of their entry correct. If you miss the deadline don't worry as Clifton CC normally organises a trip to take in the "all passes" route during the summer months - when we attempt to arrange for better weather (but can't guarantee). One of the major sportifs can provide a great target and be a real motivator but can also be expensive and require a lot of preparation. If you are interested in this aspect of cycle sport why not benefit from the experience of our members. You only have to post a question on the discussion board and fellow enthusiasts will be happy to advise on equipment or training and share their experiences of tour operators and potential pitfalls when arranging your own travel!